Since attending traditional parishes I have not experienced this. In fact, soon after attending the TLM regularly at the FSSP apostolate here in Toronto last year(The FSSP recently left the Diocese of Toronto early this year), our priest addressed this very issue just before going into his sermon. He gave a quick instruction on a proper confession. This was a response to some penitents who were doing a lot of talking or sharing - as you described in your post - instead of just clearly confessing their sins. As a young Man I cannot comment on #2 & #4, but I shall try and get address 1,3&5. 1) I'm not totally sure that this is the case in my home parish and my Sunday Parish, by and large Fr. G and Fr. L will cut off people who are simply talking about problems although I confess I did once take up 20 miniutes in the Cathdral confessional talking about my problems and not even asking for absolution at the end. 5) This may be the case at certain parishes again Fr. G certainly makes appointments outside the confessional for people who need spiritual direction. Fr. L is a priest that likes to get to the root of the sin so he can give sound spiritual advice as to how to avoid it and give an appropriate pennance. i.e. when I was having difficulty with a particular vice last year I'm sure that he knew every Sunday that I was doing my best to ovecome it and therefore the pennance he gave me wasn't as severe as it might have been. I find this much more attractive than two of the Local N.O priests who are scheduled to hear confessions everyday and to apperences view it as a sacramental clean-up and don't give any advice beyoned 'pray more and try not to do this again'. This is one reason I never go to my local parish for confession, where it is once a week and where they have a "confession evening" twice a year with diocesan priests. Instead I go into the city where they have it every day. At my local parish my priest would always end up having a chat about Mass attendance among the people of my generation, every single time. The "confession evenings" would also take hours and hours. As for the number and kind idea, I say confession like this to the best of my ability, though sometimes I elaborate if I think it is necessary. I must admit that there doesn't seem to be much of a problem at the parish in the city in terms of lengthy confessions. The priests there get through at least seven or eight confessions within the 15 minute time slot. Also, most give only a passing comment at most and often just move on to the penance and absolution. However, I do not think this is all that common in my diocese. Finally, a question on the number and kind aspect. What exactly is "kind"? Is it vague or specific? I've been afraid to ask about it since it seems like a stupid question. I strongly suspect that 1) is the cause of this phenomenon, along with a little of 5). It seems that practices such as the removal of confessionals and the creation of 'reconciliation rooms' has undermined the sacramental nature of confession in the eyes of the average Catholic. In addition to this, the lack of catechesis, as you rightly point out, means that people are unaware of the distinction between spiritual guidance and penance; in fact, the use of 'reconciliation' rather than 'penance' leads one to think of something rather more like counciling than a sacrament. "I am particularly interested in hearing from those of you who attend Extraordinary Form parishes." It's never that long at my parish. And in my experience in other places women do take longer but not always. I would say that the priest should tell them to come talk to them outside of the confessional at a later time in order to speed up the process and hear everyone's confession (you never know who is waiting in line and has a mortal sin that needs confession asap). But perhaps people want to talk about their problems anonymously assuming that they were confessing behind the screen. We have a place nearby with Confession every day - in fact twice a day, but the rule still holds. It's not just about that there are too many people in line - my circumstance from this weekend happened with only two people ahead of me - it's just the people take too blasted long. Regarding kind, I've always thought it had to be specific enough for the priest to understand what you mean. So, for example, it might be too vague to say "I had a fight with my brother in law," since (a) fighting is not always in and of itself evil, (b) it doesn't say who was at fault and (c) fighting might not be the sin that needs to be confessed. In such a case, I might say, instead of "I had a fight," something like, "I was drinking too much, started calling my brother in law named and then ended up hitting him with a chair." Now I've really confessed something - getting drunk, calling somebody names and physical violence, none of which were really covered under "I had a fight." On the other hand, sometimes just saying the name of the sin is enough without anymore elaboration. A person who goes in and says "I masturbated" doesn't need to go into any more depth. I don't know if this was what was really touched on, but I think that sometimes people want to give excuses for committing sins. They might not care about recieving counsel as much as they care about not looking so guilty. I used to have this problem and my confessions would take about 10-15 mins. I used to be so embarassed because I knew the priests personally and didn't want to seem like such a screw-up. I would pad my resume so to speak. LOL..."padding your resume." I think that is very likely. The biggest tragedy with this is that since Confession is usually offered (regularly scheduled) for only 1 hour per week on Saturday, that means this is the only time the average parishioner can go - and if people/priests are going to take up large chunks of that hour on a few penitents, that screws the rest of the folks in line, many of whom will have to miss out! This means that many folks will have to leave with guilt on their conscience, and wait at least till Monday, if not longer, like next Saturday. That's just cruel. I think there is one other factor that I didn't see mentioned: some parishes have so few people in line for Confession, that when someone does come, the priest uses this as an opportunity for a "counseling session" of sorts. This is the case I experienced at two parishes I stopped by at where the priest literally could time *every* confession to be 30 minutes on the dot! I've also been to places where people took multiple sheets of paper of all their sins/problems into the confessional and used this as a time for a sort of homework and book report type session. Also, as was briefly touched upon, priests/penitents are confusing Confession in general with spiritual direction (which is really for those discerning the religious life). I confess to "padding my resume" with venial sins, and just slipping the mortal sin in the middle. It makes it easier to say if you get on a roll first. I'm not trying to cheat, really, so much as out-smart my timidity. I've done that too...it's easier to confess and embarrassing mortal sin by surrounding it with a ton of venial sins. When I came back to the faith, I learned how to confess from Bishop Sheen in his "Ye Shall Know the Faith" series. He emphasized how short a confession was of someone who hadn't confessed for 50 or so years. It was maybe less than one minute. I keep my confessions short and to the point. 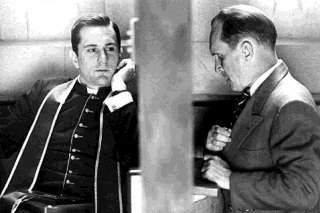 If I need to have in-depth counsel, or make a general confession, I schedule it with my priest. It is common courtesy. You've got to keep this in mind, since it may keep someone from communion. I realize some people need more time, but, yes, there are times when I'm in line and wondering, "What are they talking about in there?" I'll add these comments from a exclusive traditional parish. We have confession once every morning, and before each Mass on Sundays. During the week it is not crowded at all, but sometimes people will use this time to make extended confessions and counseling. Sundays are generally packed to the gills. We have overall a rapid flow. We have had sermons on confession, and I think most people understand the basic form. Every once in a while there will be someone who will eat up a lot of time. Since we had confessions on sticking to the facts, this may be the problem. Our priest has mentioned people not always udnerstanding if something is a sin or not. Also, people will blame someone else for something, and that needs to be sraightened out for a confession (you're supposed to blame yourself). I once was behind a confession that was forever, and I was getting very impatient, probably adding to my own confession. The the kid came out balling, and it is a kid in our parish who is somewhat asperger's and has had a lot of setbacks in his life. I didn't make confession that day, but I learned a lesson. I tend to actually think that it was God's way of saying, so to speak, come back and make your offering when you have forgiven your brother. Our priests are on the ball about this, and ultimately they've got to "train" the people how to confess. Since we've received a few sermons, the lines usually move pretty quickly. In your experience, spiritual direction may be exclusively "for those discerning the religious life." But I challenge you to think more broadly. Why should religious or "pre-religious" alone avail themselves of this opportunity? Is not spiritual erudition a boon for anyone's personal vocation? I'm not at all suggesting only those in formation/discerning can or should have spiritual direction. They can. My point was that regularly scheduled Confession times (esp Saturday) are not the time for spiritual direction. It's indecent to take up large chunks of the already short time frame and priestly availability with what is really to be more of a privately scheduled one on one time. Further, most such people don't privately schedule times to meet, and don't discern between spiritual direction and a "counseling session." Min4-Confessor accepts advice or asks for more clarification. Min5-Absolution, Act of Contrition, Penance assigned. All of these need not necessarily take a whole minute each, so this can be reduced to even 3 minutes comfortably. When someone goes in there - when there is a line waiting - taking 10, 15, even 20 min, they're not there for the right reason. They haven't done the pre-Confession personal reflection they're supposed to in order to get to the bottom of why they're confessing. The only noteworthy exception I can think of is of a lapsed Catholic who is returning for the first time and might really need that 15 minutes or so. But in my experience, those aren't the ones typically causing the "traffic jam". If the typical Catholic can only get there on Saturday, then they shouldn't be faced with running out of time, especially if they get there early. There is a sort of decency and 'awareness' Catholics need to have for their fellow Catholics, and one such act of 'awareness' is knowing others need the Confessional and you shoulnd't be the one shutting them out. another possible reason is the psychological training and immoderate egos which some (thankfully few) priests have. They seem to put greater faith in their therapeutic words than in the power of the sacrament. Also, sometimes a priest might spend a lot of time focussing on one item in the laundry list of sins--especially if that sin is one of the pet peeves of the priest. This can occur even when it is not a mortal sin which is at issue. I think "padding the resume" is OK, particularly if it is a pyschologically necessary context for mentioning the more serious sins. The resume-padding sins however should be genuine, even if only venial, sins; and when we get to the serious sin we should specific and complete. But that does not entail speaking a lot. Good priests will understand the need for certain penitents to use certain "crutches" to approach and speak to the King on his throne of Mercy. This problem most definitely arises from the modern view of the sacrament of penance as reconciliation, no longer requiring the penitent to kneel, but allowing him to sit face-to-face with the priest, which is more conducive to a friendly chat than to a humble confession of one's sins. Nowhere is this more evident than in France, where all the old, venerable confessionals have been replaced with see-through glass cubicles about the size of a bathroom. There is usually no screen within, so one has no option to confess anonymously. There is often a table within with two chairs on opposite sides, one for the priest, and one for the penitent. I remember being in line for the confessional at the Basilica in Lisieux, and a female foreigner openly cut right in front of me with no apology. I watched as she entered the confessional, plopped down in the chair, and proceeded to smilingly (and at times laughingly) chat with him about this, that, and the other for 30 minutes. When she emerged, she made a gesture letting the rest of us know the priest was no longer hearing confessions that day. Let's just say I had to exercise a bit of self-restraint with that one. I never have this problem at my FSSP parish. What a sad story! I do recall, now that you mention it, that those who take longest are those who I can see through the little window who are sitting in the chair. I had a similar experience--at the Divine Mercy Shrine no less--a person cut in line and used up the remaining time for the confession, and then told us the priest could hear no more confessions for that hour. My anger was somewhat assuaged by the exiting priest who told me that he would hear my confession after the Mass. Some people can be very proud and rude. It's an offensive pharasaical religious pride. They think that they are intimately and specially related to a spiritual center (Lourdes, the Divine Mercy Shrine, etc) and that they must make a public act affirming this. This is also a common problem with spiritual beginners. They just never understood the whole humility thing. Well, let's pray for them, endure them, but also rebuke them for their own good. And rebuke ourselves--too, lest we fall into this particularly odious manifestation of religious pride.